On January 22nd, The Theological Fellowship @ Covenant Seminary will be hosting their 2nd annual theological conference. I am excited to be attending and presenting. The theological fellowship scored big by landing Esther Meek as their plenary speaker. Meek is known for he work in Reformed Epistemology. Her address is entitled "Longing to Know: Covenantal Epistemology." Previous speakers for The Theological Fellowship @ Covenant Seminary have included: Robert Yabrough, professor of NT at Covenant Seminary and the 2012 theological conference plenary speaker; C. John Collins, professor of OT at Covenant Seminary and the Fall, 2011 Bantam Lecture Series lecturer; and Nicholas Perrin, Franklin S. Dyrness Professor of Biblical Studies at Wheaton College and the Spring 2012 Bantam Lecture Series lecturer. 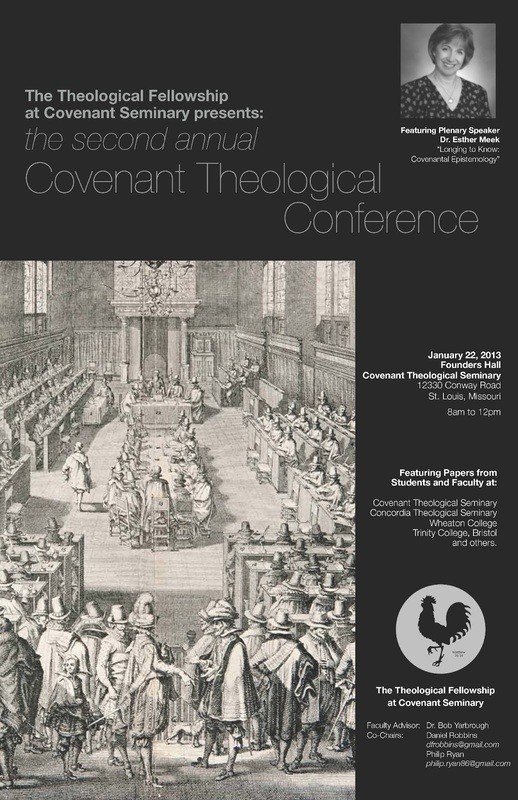 The conference will include students and faculty from Covenant Seminary, Concordia Seminary, Wheaton Graduate School, Trinity College (Bristol), and other institutions. It will be held on Covenant Seminary's campus, on January 22nd from 8am to 12noon. Admission is free, and it would be great to see you there if you have availability!